Galhinia has decided sitting on eggs is for the birds, and abandoned her post. Bella hangs about in the kitchen most of the day. This is a function of her not feeling well, her large unwieldy size, and a lack of fitness. During the afternoon, I took her outside and put her in the flower bed. She settled down to her first dust bath ever. Good news. It only lasted 3 minutes and she waddled back inside. However, it is progress. I am however frustrated that she is not remarkably better. Thinking of seeking additional support and treatment from a homeopathic vet. Galhinia is not herself. Took her to Jean yesterday, and although it is clear her mood is depressed. No other symptoms. Good doses of probiotics have cheered her up substantially. She is still eating and drinking, but spending time fluffed up in between and not as lively as usual. 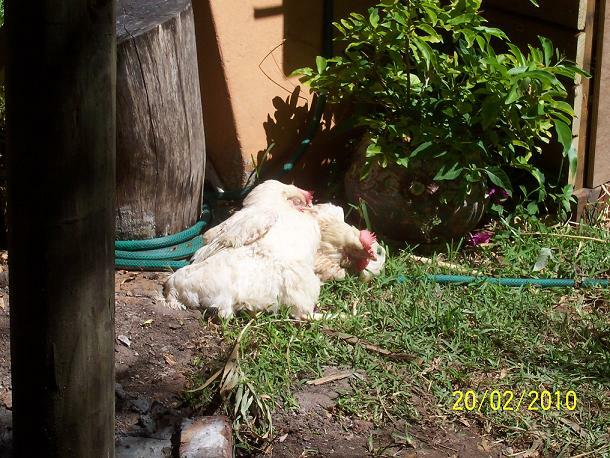 Have been asked by a woman in JHB to rescue and re hab 4 chickens for her. Sounds like she has a divine set up. 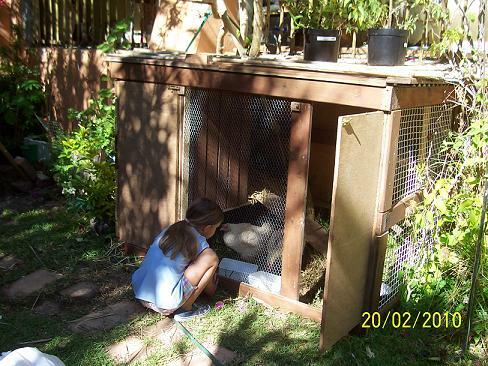 Need to go and get the hens this weekend, make sure they are all healthy, and re home. This is good news for 4 more ex batteries. Will keep you posted. can eventually send you some pictures. And very exciting, we’ve been finding eggs in the garden!! 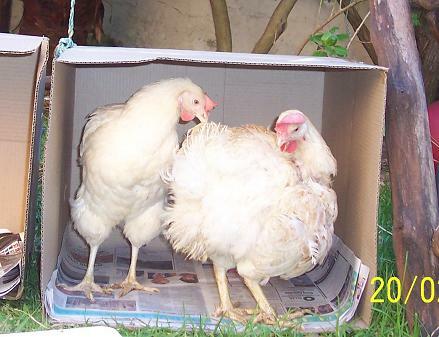 Not sure if both laying or just Petunia, very clever chickens! We just love them to bits and they seem very happy and healthy. They come running up to us if we go into the garden, seems they enjoy our company. They discovered the compost bed the other day and have been digging and scratching in there everyday since! Heaven for chickens with all the bugs n worms. I noticed that they lay down/slept quite a bit during the day in the garden when they first arrived, but dont see much of that now. very sad reading about Bella Ella, isn’t it just too awful what we humans do to these poor creatures, will pass on the blog site. thanks again for all your help. Galhinia is a regular morning layer. Amber however, seems to have produced only one egg in the month we have had her. Yesterday we discovered that Amber has secretly been laying behind our municipal dustbins in the back yard. We found her stash! Now that her secret has been revealed she decided to move into the hen-house this morning with Galhinia to lay her egg – apparently a very sociable activity. 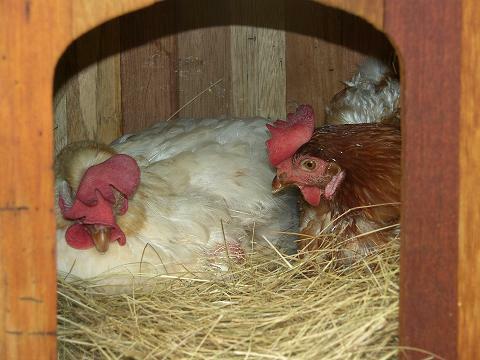 They clucked, dug, re arranged the nest together, checked each others nether regions and were a bunch of regular old hens. After Amber had laid her egg, she left the house, and Galhinia rolled Ambers egg under her body, next to her egg. 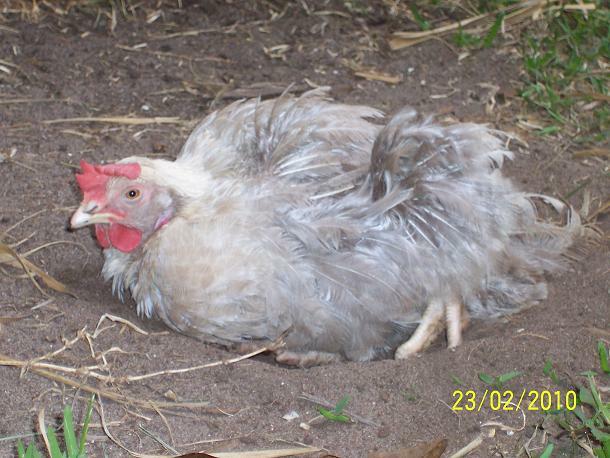 Hens look after each others fertilised eggs, so that they all get an opportunity to eat, drink, and have a break from the duty of egg hatching. I have seen none of this displayed in our hens so far. This morning was the first time I had seen this happen. Galhinia is now dutifully minding the two eggs in a very contented fashion! Bella had her check up yesterday. A trip to the vet is stressful for Bella and myself. 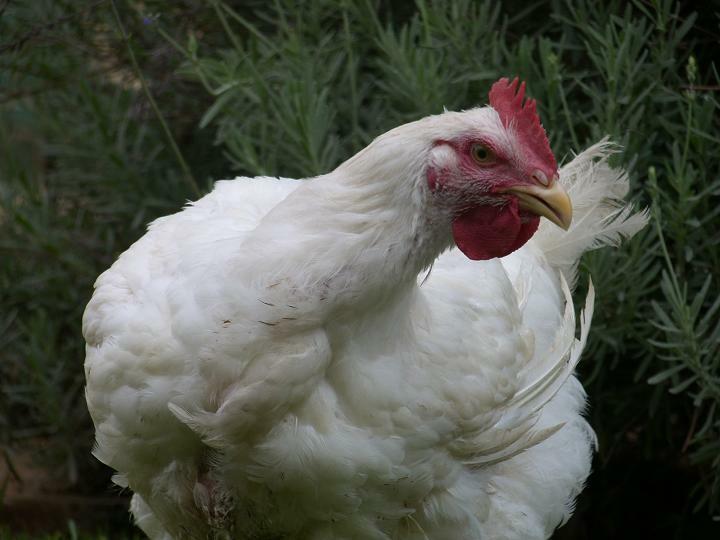 Bella starts very stressed chicken behaviour, which is always worrying with her oversized heart. I also had to have bath when I got home, because she pooed all over me. Felt sorry for Bella that she was stressed enough to poo, but felt more sorry for myself! Bella’s entry into the waiting room at the vet always attracts a lot of attention. 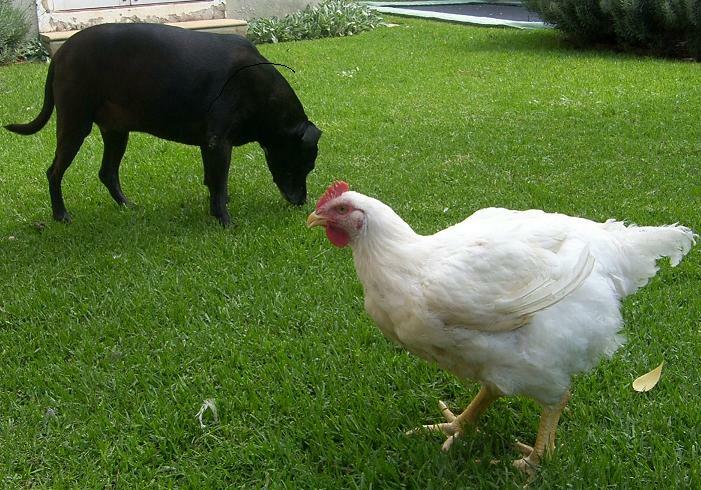 People are so delighted by her, and find the insertion of a chicken in our dog and cat ruled neighbourhood a treat. I choose to smile nicely, hold back, and not ask them if they are going to delight in the presence of Bella, and then go home for chicken pie! There is a massive disconnect between the reality of the animal being here, now, and animals as food. I know that when most people look at Bella at marvel at her size, they have no idea the price she is paying for that size, and that they are more than likely supporting this cruel practice of raising Broilers for meat by their purchase of chicken as food. See our links on this blog to find out more about this insane and gross industry. Bella is showing signs of improvement. Jean has put her onto a water based anti bio, to give her a break from the injections. Bella had a bad night again. I got up a few times to check her as I could hear her coughing and sneezing, and shuffling around. She has started to make gentle clucking noises of acknowledgement when I go to her in the dark at night which is absolutely heart warming, and softens the blow of being pulled from my bed by her alarming sneezing. Bella and I have survived a weekend of my injections. I felt very despondent when I put her to bed last night, as her open mouthed abdominal breathing seemed to have increased, and she was coughing frequently. However, this morning, a night of heating and humidifying seems to have helped. We are off to the Jean, the vet, in the next hour for Bellas check up. 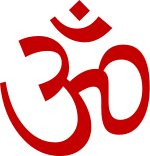 I am feeling frustrated – how are we going to beat this? and when? and at what cost to Bella? Earthlings is an award-winning documentary film about the suffering of animals for food, fashion, pets, entertainment and medical research. Considered the most persuasive documentary ever made, Earthlings is nicknamed ‘the Vegan maker’ for its sensitive footage shot at animal shelters, pet stores, puppy mills, factory farms, Slaughterhouses, the leather and fur trades, sporting events, circuses and research labs. The film is narrated by Academy Award nominee Joaquin Phoenix and features music by platinum – selling recording artist Moby. Initially ignored by distributors, today Earthlings is considered the definitive animal rights film by organisations around the world. “Of all the films I have ever made, this is the one that gets people talking the most” says Phoenix. “For every person who sees Earthlings, they will tell three”. South African based Animal Voice is an amazing organisation that does great work. I have huge respect for Louise Van der Merwe who keep this particular show on the road. 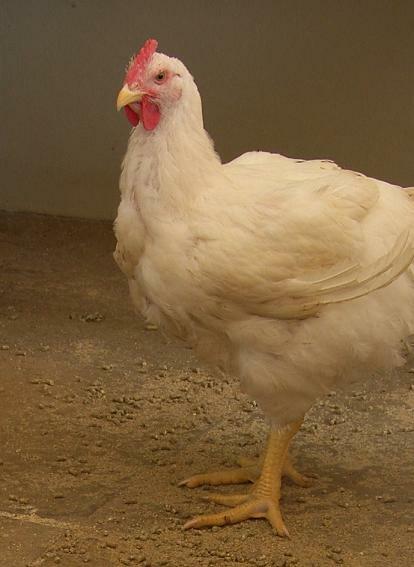 Find out more about the cruelty of the broiler industry. Stop supporting this cruel practice, by eating chicken and, start putting pressure on your local supermarkets to put pressure on their suppliers for better conditions. Christen Shepherd, a gal who always wanted to be a farmer, runs a rescue farm. The farm is a safe haven for animals coming out of factory farms — this includes bald chickens, goats, hogs and pot-bellied pigs. What’s amazing is that these animals help extremely troubled kids feel happier. Got up during the night to change the baby’s hot water bottle, and set alarm to feed at 5am. Had great feed. She was sleepy and cuddly. Changed hot water bottle and put her back to sleep. Checked her before left to take kids to school at 7am. She was sleeping soundly. Got back at 8am to find her box empty. Our domestic worker, and chicken lover extraordinaire Nicky, and I searched the house for her. It soon became apparent that our dog, Stella, had got into the bathroom and eaten our baby bird. The realisation of what had happened was a huge shock. I felt devastated for our little girl’s life to end in such a way. I felt guilty, I felt sad, I felt overwhelmed. I played leaving the house over and over in my head trying to figure out if I left the door open, or if I had shut it. Had Stella opened it on her own (something she has been known to do), had someone else in the house left it open. I don’t know. I feel very responsible. Feeling very sorry for our baby, I then began to feel very sorry for myself. I wanted to stop what we are doing with the chickens and birds. I wanted to bow out of the responsibility I have taken on ……however when I pulled myself together….this is neither useful, nor fair to the many birds we have given a better quality of life to, and the chickens that we have not met yet, who will have better lives. To find meaning in this is hard. If there is a lesson to learn, which I want there to be, so that her little life was not in vain. She gave us 3 days of immense joy and love, and I learned so much from her being here for the next rescue. Maybe it is to highlight and heighten our awareness around safety, something we are so careful about, but in the rush of morning routine, we may have dropped a ball, and we can’t go back. I am so sorry little angel. You touched all of our hearts in this short time.